Last fall the modern quilt guilds had a challenge involving the Habitat fabric line created by Jay McCarroll. Each participant received a cut of six different prints from the same colorway. Our guild had the brights colorway. We decided not to place restrictions on the project type, and participants were allowed to buy more yardage of any of their prints. 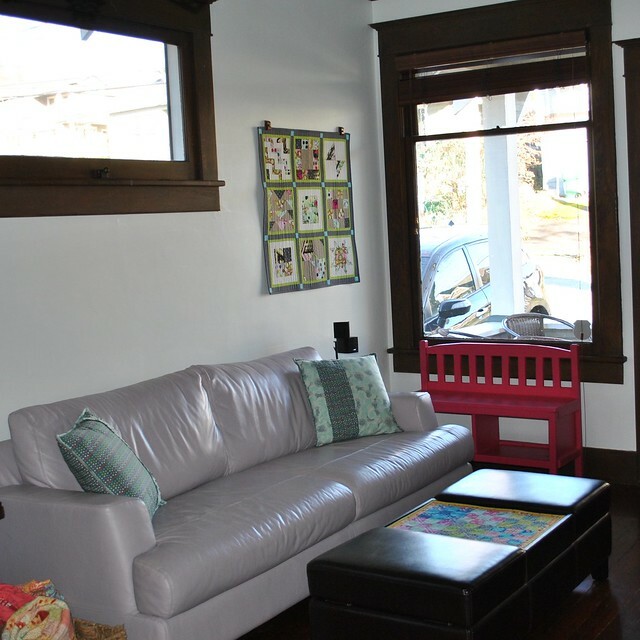 Solids were the only fabrics we could add that were not part of the Habitat fabric line. I decided that the very modern style of these prints would work well with a bit of traditional piecing. I had visions of a sampler style quilt, so I started piecing blocks in some of my favorite patterns. To challenge myself a bit, I used solid white in some blocks and solid khaki in the others. Originally I planned to frame each block in a hot pink solid, but I couldn't find the right shade of pink. 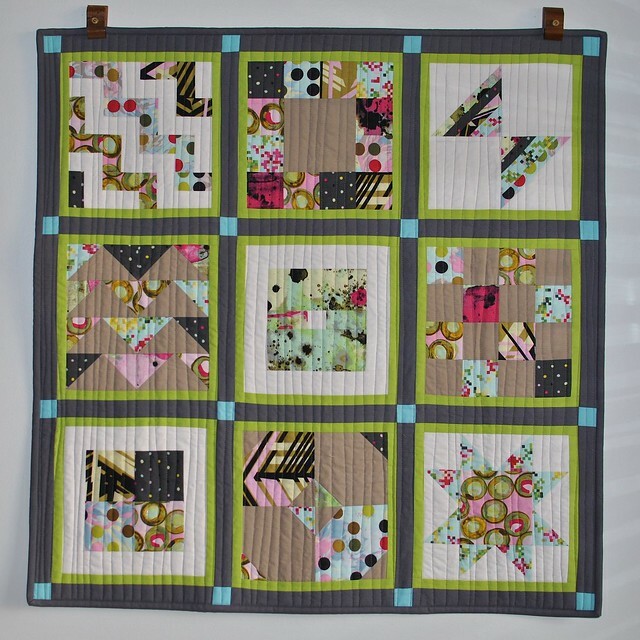 I had a bit of kona in chartreuse in my stash, which worked really well to frame the blocks! And then I got stuck on the border. My first instinct was to use white in the borders, but that caused the khaki blocks to look out of place. While I was chatting with some quilting friends one night, one of them suggested a dark grey border and maybe some cornerstones. 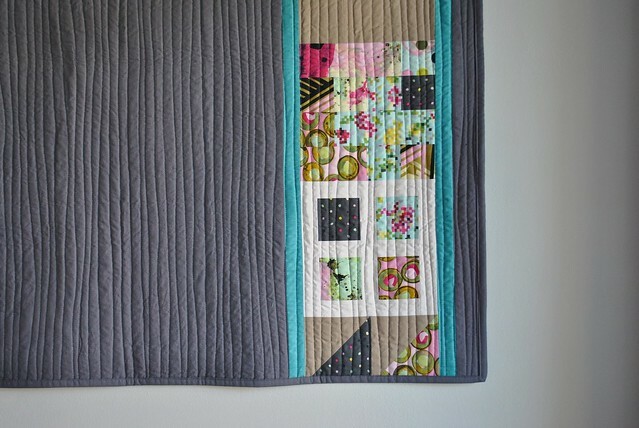 I loved the grey border right away, and the bright blue cornerstones really tied the whole quilt together. 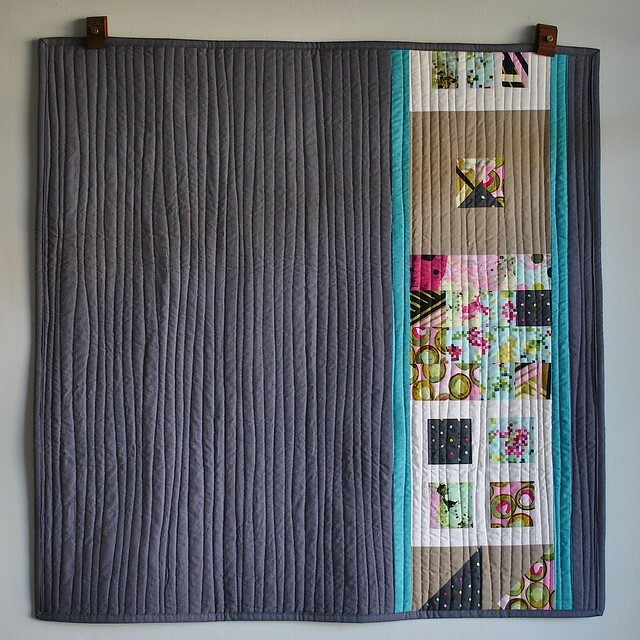 To keep the quilt modern, I quilted it densely with organic straight lines. Dark grey binding keeps the eye focused on the quilt blocks. Several quilt blocks didn't make the cut for the quilt top. I included them on the quilt back, along with thin strips of crossweave on either side of the pieced strip and dark grey for the background. 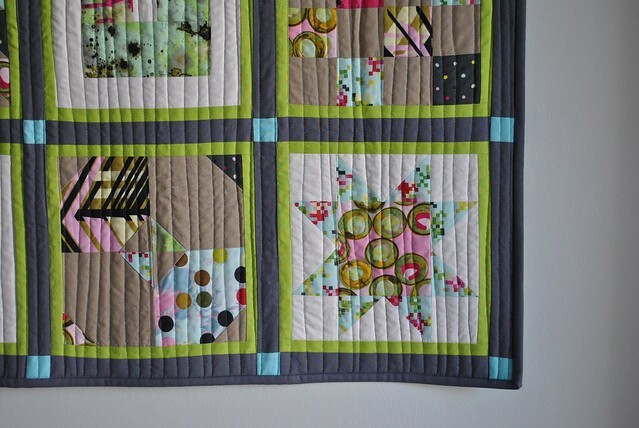 I purposely left a label off of this quilt, so that we could display the quilt front or back!